Match Officials: Referees – Adam Devcich and Grant Atkins; Touch Judges – Adam Reid and Chris Sutton; Video Referees – Steve Chiddy and Steve Folkes. Massive Raiders triple-header at Bruce/GIO Stadium and on Fox Sports kicks off at 10:30am this morning with the Raiders taking on the Dragons in the Holden Cup. After that we have the NSW Cup clash at 12:30pm between the top of the table Mounties and Illawarra sides. To finish up we have the NRL clash that will see the return of Josh Dugan to Canberra for the first time to play his former club. 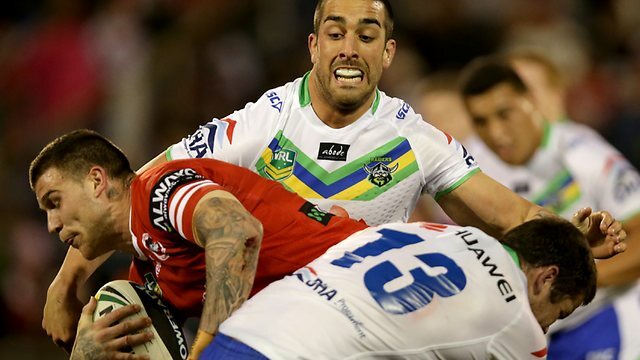 Will the famous Raiders hoodoo over the Dragons strike again? Find out right here from 3pm! We'll have LIVE updates of all three matches throughout the day. Ready to go in the Holden Cup in Canberra between the Raiders and Dragons. St George kick off and it's game on! Raiders score first! McGrath just dummies and runs from dummy half and gets a great try from close range. Converted by Kent. Raiders 6-0 after 4 mins. Awesome Raiders try! Garard sprints after a high bomb from Kent and takes it on the fly and runs in under the posts to score. Kent converts. Raiders 12-0 after 10 mins. Good start! Dragons score. Higgins chases a grubber into the corner and plants it down for the try. Conversion missed. Raiders 12-4 after 21 mins. Dragons are challenging a no try call against them for a knock on against Aitken. Clear lost ball. That's half time Raiders lead 12-8 after an entertaining half of footy. Start of the second half with the Raiders leading the Dragons by 4 with a 12-8 score line. Kent kicks off and restarts play. Dragons score down the sideline and run it around under the posts to improve the conversion position. Converted. Bird was the try scorer. Dragons take the lead 14-12 after 52 mins. Dragons score again after kicking a 40/20 and getting the quick tap. The Raiders never got enough defenders back on side to stop them and Aitken goes over for another try after they spread it wide off the tap. Converted. Dragons 20-12 after 54 mins. Raiders only have one fit player left on the bench after a few injuries. Dragons score three in a row. They go down the same sideline and their number two ends up with it and gets the try. Raiders have fallen asleep in the last few minutes. Dragons 26-12 after 57 mins. Dragons have their fourth try in about 8 minutes with Aitken picking up a hat-trick. Crook converts. Dragons 32-12 after 59 mins. Raiders hit back! Hurst divers over in the corner after Creith got the Raiders in great field position by taking an intercept and running close to 80m down field. Conversion from the sideline from Kent just misses. Dragons 32-16 with 13 mins left in the Holden Cup.